Antalya was actually first founded by King Attalos II in 150 B.C. after commandeering his troops to find for him "heaven on earth", which they did in this very special province. With a rich history and an even more bountiful natural environment, coupled by a city with a center in one of the country's best preserved ancient towns, Antalya is a pretty special place, yet remains off the beaten track for many foreigners. 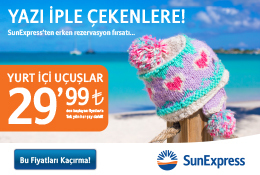 However, Antalya happens to top the charts for many for a unique experience in Turkey and, therefore, the following is the best of the best this province has to offer. 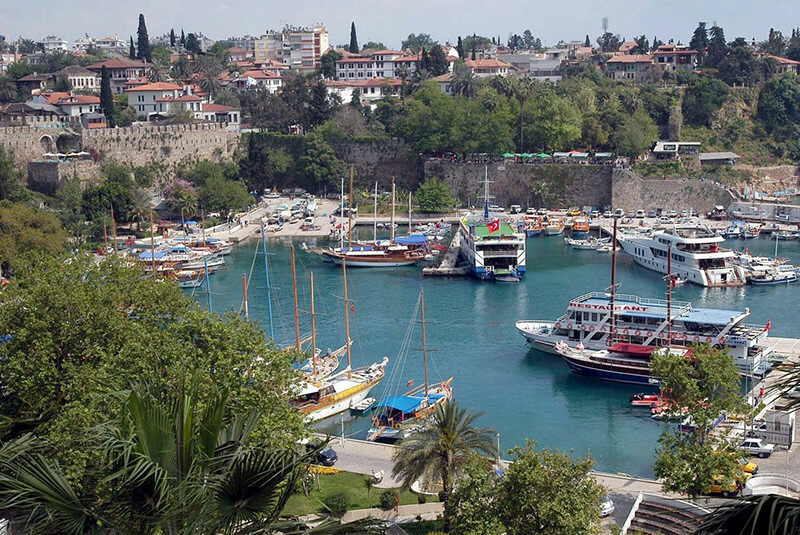 A major Roman Port, the city of Antalya is replete with ancient ruins and the old center, aptly named Kaleiçi, which means "within the castle," gives the feel of walking through winding streets of history and old stone buildings with many stories to tell. Now, the historical Ottoman mansions serve as guesthouses and boutique restaurants making it one of the most critical areas to visit when in Antalya. One of the wonders of this miraculous city just happens to be Hadrian's Gate, a monumental triumphal arch that stands grandiose to the entrance of the Kaleiçi, district. Constructed in 130 A.D. to commemorate Emperor Hadrian's visit to the city, there are two towers on either side of the gate each from different eras, one being from the time of Hadrian and the other from the Seljuk period, just going to show how this city has always been popular throughout the ages. A lesser known fact about this coastal Mediterranean city that happens to be the eighth most populous in Turkey, is that it also houses arguably one of the best museums in the country. 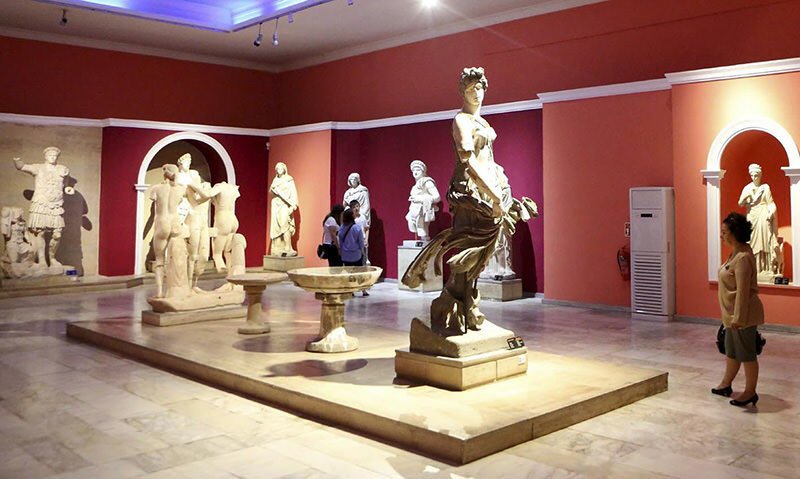 Set on 7,000 square meters with 5,000 works of art on exhibit, Antalya Archaeology Museum has 14 different halls devoted to different eras and materials including one with statues of all of the mythological deities, otherwise known as the Twelfth Olympians. Definitely a special treat, this museum is accessible from the city center by an old-fashioned tramway. Spread out between the Mediterranean, in an area referred to as Turkey's Turquoise Coast and the Taurus Mountains, Antalya is teeming with ancient ruins. However, there are a few ancient sites off the beaten track that are quite possibly in the most picturesque natural settings there could be. Phaselis, situated directly on three bays, and decorated with pines trees, is an ancient Lycian town dating back to the seventh century B.C. Traversing these ruins can transport anyone's imagination to ancient times with remnants of shops, stores and the Roman baths the town was famed for. Located near Finike, which neighbors Demre and the home of Santa Claus, lays Arykanda, a lesser-known but much more impressive set of ruins that crown a mountain peak with spectacular views. Considered to be the Lycian "party town," it was built on five-terraces on a south-facing hillside, and not only is it one of the best preserved ancient Lycian towns but it is also the most dramatically situated and one of the oldest sites in Anatolia dating back to the second millennium B.C. A UNESCO world heritage site, Xanthos was once the capital and most luxurious city of Lycia and as a result, houses the most extensive antiquities. With ruins also dressing a south slope, this ancient town has been mentioned numerous times in the "Iliad" and by countless Greek and Roman writers, even Strabo. 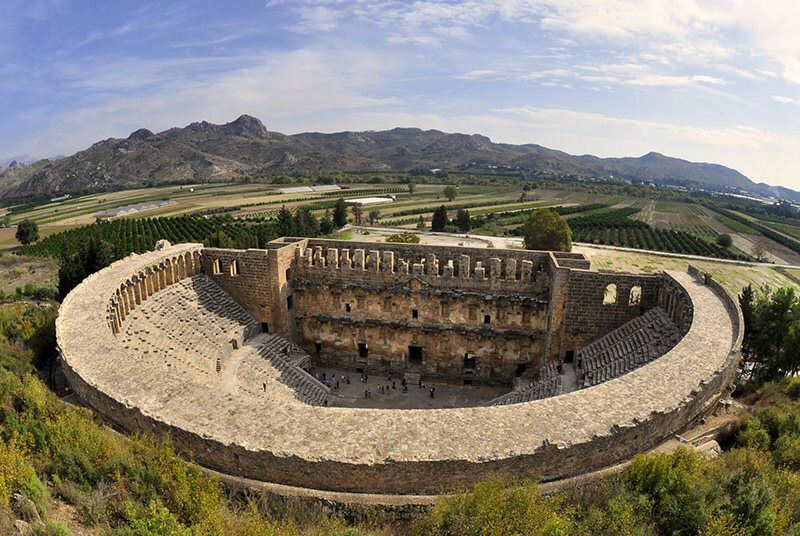 Last but not least is Aspendos, an ancient city in Asia Minor dating back to the fifth century B.C. 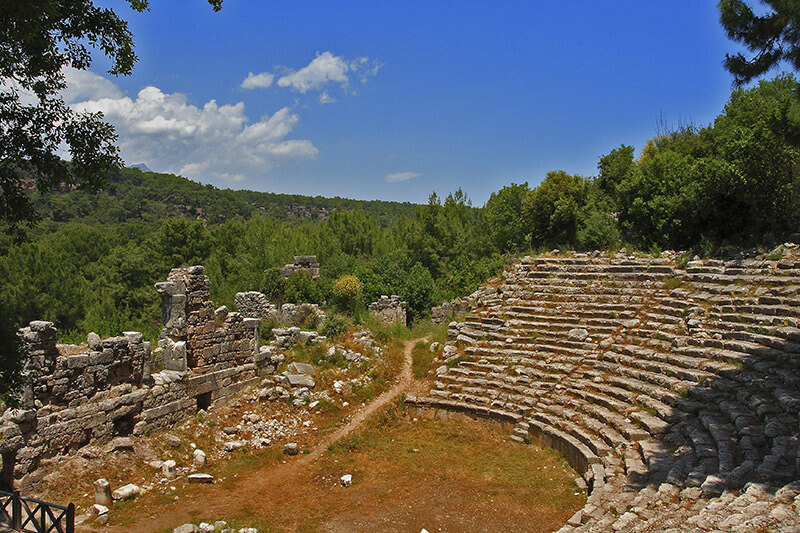 Its ruins are located 40 kilometers east of the city of Antalya and were situated on the Eurymedon River, just kilometers in from the Mediterranean Sea. These days the impressive amphitheater is lit up to spectacularly host the annual opera and ballet festival, making this hands-down the most picturesque musical concert venue in the country. 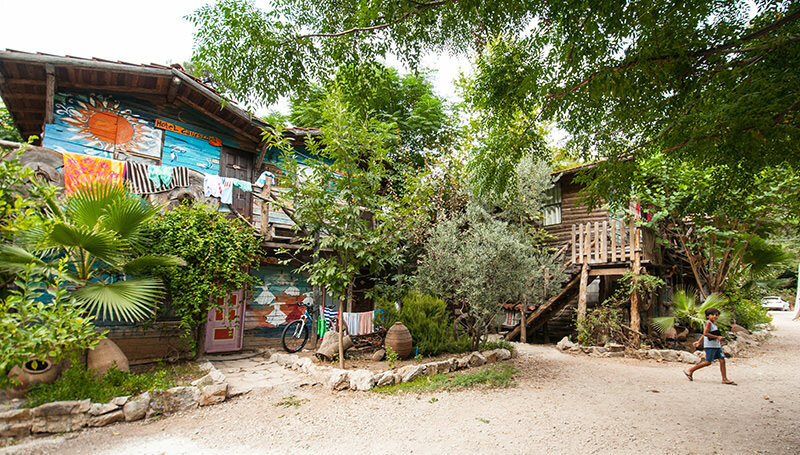 Olympos is Turkey's first-ever tree house town that lines a valley leading from shore of the Mediterranean Sea in an area that happens to be the breeding grounds for the endangered loggerhead sea turtle. Said to have been coming to the beaches of Olympos and neighboring Çıralı annually for the past 40 million years, as a result, Olympos has perfected the art of tree houses, bungalows and platform bedded seating for a very relaxing experience in an effort to carefully preserve the area's natural legacy. Meanwhile, the area's biggest social event in the evening is jumping on the back of a truck or tractor that takes visitors to the hilltop where the chimera flames burn eternally. The Yanartaş (Turkish for "flaming stone"), is a must-see experience as the flames burn simultaneously at the top of a mountain and are fueled by gas emissions seeps from the earth that meet the air. According to an ancient legend, it is the breath of a creature that terrorized the Lycians and was believed to be part lion, part goat and part snake. The Lycian Way, a 540-kilometer long-distance footpath that winds through ancient ruins and forests with striking views of the sea, just happens to run from Fethiye to Antalya's Geyikbayırı. Less known is the Saint Paul Trail, a 500-kilometer long-distance footpath that begins in Perge and ends in Isparta with a second branch starting at Köprülü River. This path follows the route Saint Paul the Apostle took on his first journey to Anatolia. Geyikbayırı, located just outside of the city, happens to be the country's largest sports climbing area with crags of limestone and over 850 routes at all grades. There are a number of colorful accommodation options geared towards rock climbers, making it a mini paradise for those who want to hug a rock and take a swim all in the same day. 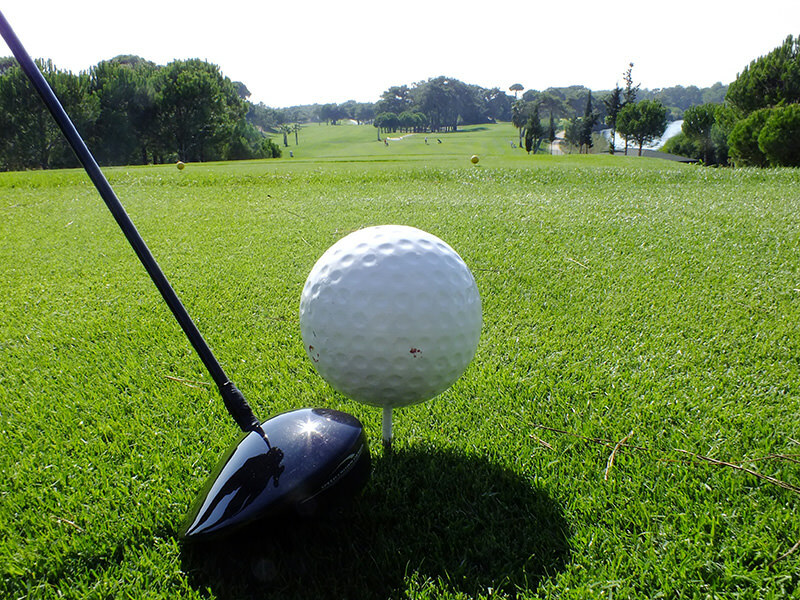 The beach resort town of Belek, previously famed for its five-star hotels and spa centers, has now become Turkey's top golfing destination. 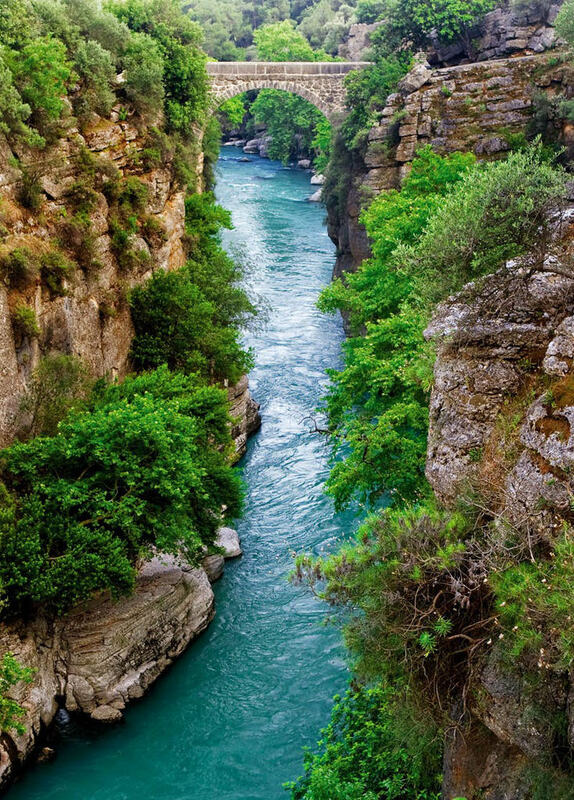 Köprülü Canyon, a national park located 100 kilometers from the city, just also happens to be Turkey's top water sports destination with dozens of companies offering white water rafting tours. The canyon stretches for 14 kilometers and has spectacular views including two impressive historical bridges. 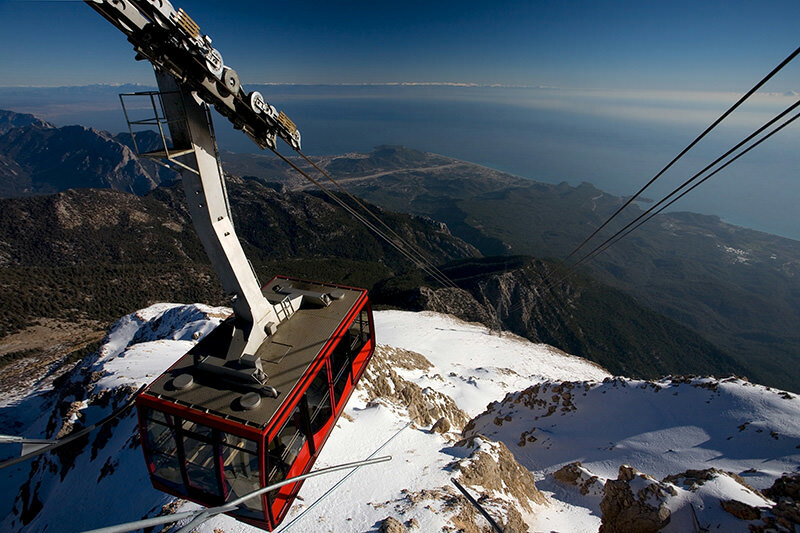 Hands down a breath-taking experience, the Olympos Teleferik, or Aerial Tram, is a cable car that runs from Kemer on the sea to the impressive 2,365 elevation Tahtalı Mountain, the tallest in the Olympos Beydağları National Park. At a length of 4,359 meters, this is also one of the longest passenger-carrying aerial tramway lines in the world. The 10-minute ride takes you from snow to the sea with spectacular panoramic views of the mountains and the Mediterranean.